Double Up Food Bucks is a program in Michigan started by the Fair Food Network five years ago as incentive for recipients of Supplemental Nutrition Assistant Program (SNAP) benefits (formerly known as food stamps) to eat healthy and boost the local economy. The Double Up Food Bucks program matches one-for-one every dollar of SNAP benefits spent by recipients to buy locally grown fruits and vegetables. The success of this program has far exceeded anyone’s expectations. 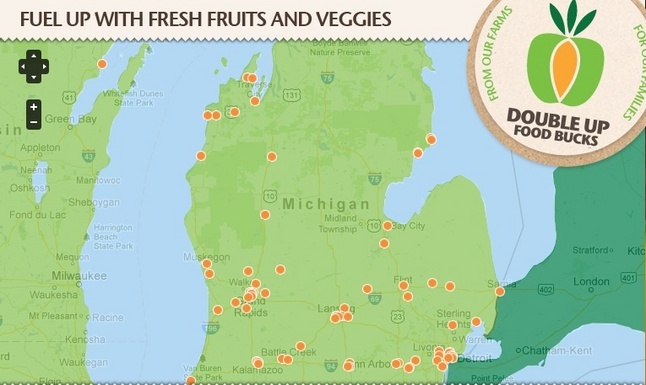 In 2013, the SNAP benefits spent at Michigan Farmer’s markets was $1,701,926, which is more than 5.5 times more than any other midwestern state. Illinois came in second with $307,507. Food hardship affects a significant portion of the U.S. population. Over 46 million Americans receive federal funds through SNAP. Even without the Double Up Food Bucks program, SNAP has proven to be an effective mechanism for helping Americans facing poverty and food hardship regain economic stability and health. Reports from the U.S. Census Bureau and USDA’s Food and Nutrition Service (FNS) show that if counted as income, SNAP benefits would have lifted 4.9 million people (of which 2.2 million are children) above the poverty line in 2012. In addition, families receiving SNAP benefits report a significant improvement in their health and wellbeing. Moreover, SNAP is good for local economies. The Food Research and Action Center reports that each one dollar in federally funded SNAP benefits generates $1.79 in economic activity. And yet, the boost to local economies is hugely dependent upon where these benefits are spent. According to a study conducted by Civic Economics, for every $100 spent at a locally owned business, $68 stays in the community compared with $43 that stays in the community when that $100 is spent at a chain. Thus, when SNAP benefits are spent at the the local farmers market or co-op, instead of a grocery chain store or Walmart, more money actually stays in the local economy. 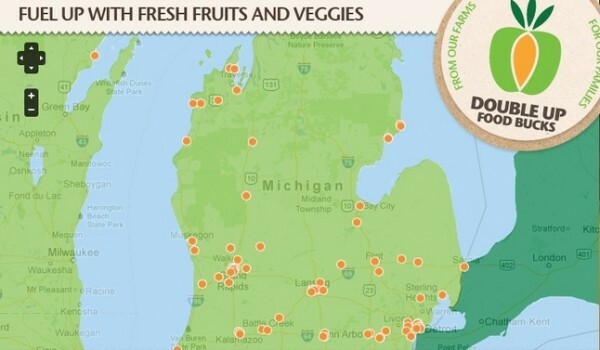 All these health and economic benefits double under Michigan’s Double Up Bucks program! Recipients get healthier by eating twice as many fresh vegetables and fruits while also supporting local farmers and sustainable agriculture and boosting local economies. Every state and city should adopt this program. Nathanael Johnson of Grist reports that there’s money available through the Farm Bill to do it. He and the Fair Food Network are holding a google hangout for anyone interested in kickstarting a program such as this in their community. It’s 12:30 p.m. Eastern time — 9:30 am Pacific — Thursday, Sept. 11. You can sign up here.